Central Asia, Mexico, Vietnam and the Middle East were new weaving territories for me this year. I am not one for making New Year resolutions but I got caught up in the moment last year at this time and went public with three weaving resolutions in one of the online weaving groups. I am happy to say that I did not even come close to fulfilling them. I say “happy” because my weaving path for the year took me off on several tangents and led me to interesting and unexpected places. I am not going to make new resolutions. I do have two or three things mapped out for the coming year and I will happily allow the gaps in between to be filled with whatever comes my way. I have to say that a lot of those gaps are being filled by you guys, my blog readers, who email me with video links, images and ideas from all corners of the world. 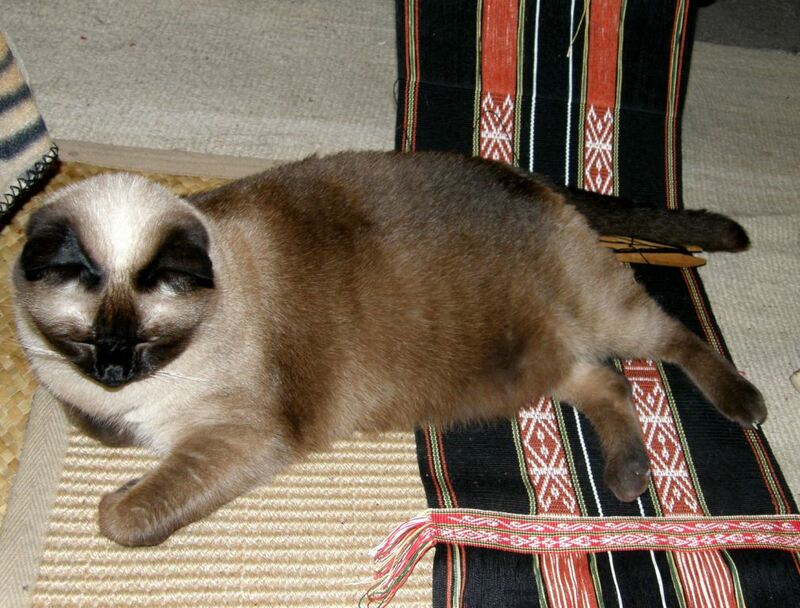 My cat loves to leave all her little beige colored hairs on my black weavings. You can see the twining at the bottom of this piece where I have finished the second part of the design. Above you can see the three parts finished. I was still debating at this stage what to do with this piece. You may remember my mentioning table runner and then center piece. Who am I kidding? This was never about the product. 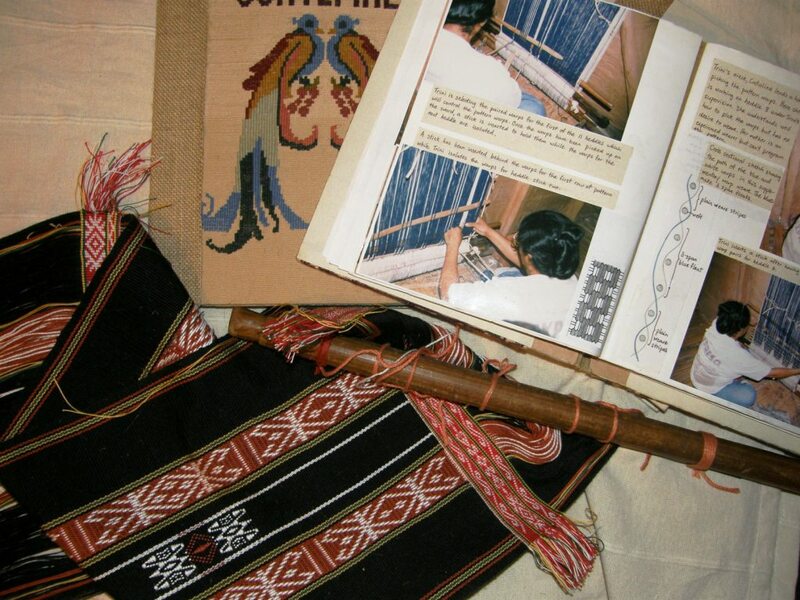 I just wanted to weave something to put the various Montagnard weaving techniques into practice. So I finally decided that the piece would be cut in two and used as the cover for the journal in which I will document the processes. 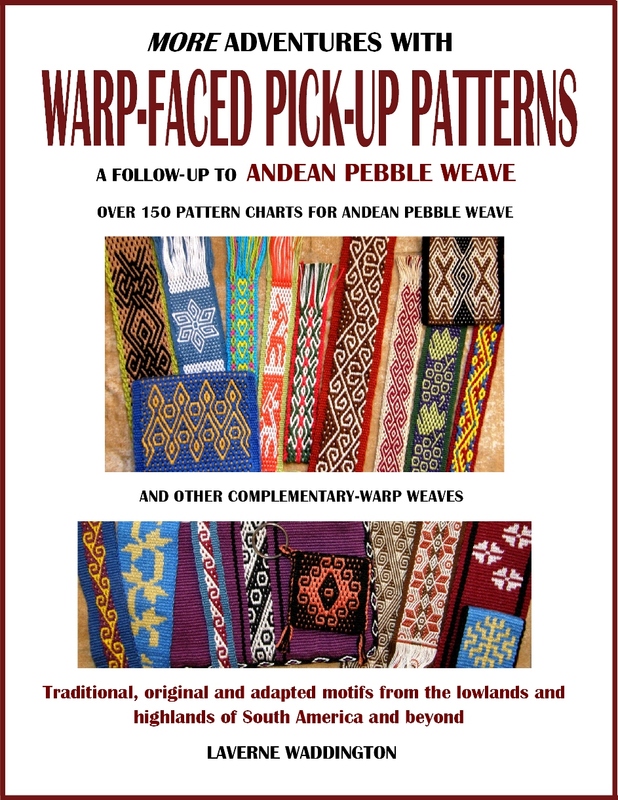 I have over twenty supplementary weft motifs to chart from photos I took when I visited the Montagnard weavers as well as their warp float designs and twined motifs which I will put in the journal along with step-by-step photos. Above left are a couple of my finished journals from other weaving trips. One has a woven cover which I made to practice the double faced supplementary weft patterning that I was taught in Guatemala and the one on the right documents all I learned in coastal Ecuador. But first I had to twine the other end of the piece. I needed to weave some more in order to have enough fabric for the book cover and then I twined the edge using one of the same patterns from the other end but doubling it, that is, I twined two rows for every row of pattern. What a difference that made! I have the pages, now I just have to get the cardboard for the journal’s cover. I stitch and bind everything together myself. Then I have to get the scissors out, take a deep breath and cut the weaving in half – yikes. An interesting thing about the supplementary pattern on this piece…usually I don’t recommend having weft floats of less than two warp spans as they barely show up on the fabric but I had to have floats that only spanned one warp on this piece in order to faithfully reproduce the Montagnard motif and, to my surprise, the design shows up very well. My base warp and weft are number 10 crochet cotton and I used one and a half strands of embroidery cotton as the supplementary weft. The white thread for the warp floats is number 3 crochet cotton and the twining was done with number 20. 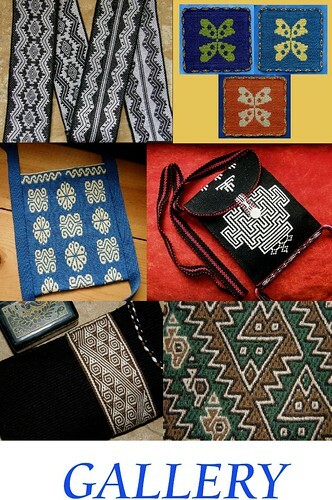 Staying on the topic of Montagnard pick up weaving, I have put together a tutorial on the woven letters that some of the Montagnard weavers are using to weave biblical phrases on their woven bag straps. I really like the shape of these letters and it is quite a simple pick up technique. The drawback is that there are some longish floats on the back of the piece which doesn’t bother me too much as bands with letters are essentially single faced anyway with the letters being reversed and unreadable on the back. The technique does not produce an entirely warp faced fabric. One weft double weave can also be used to weave letters which don’t have long floats on the back. The one weft double weave tutorial is here and the chart with some basic stick letters is here. I would like to have Angela weave a complete alphabet for me to use. I really like the solid “blocky” nature of these letters. Other beautiful, fluid and non-blocky letters can be found in Linda Hendrickson’s book Please Weave a Message with charts designed by Linda as well as adapted by her from the work of Michael Cook for card weaving. I have just set up warps to make my first attempt at twining Linda’s lettering. Her charts don’t work for the double weave pick up that I like to do on my backstrap loom but should work perfectly for twining. Hopefully next week I will have some progress to show and I will try to make something useful from the sample! 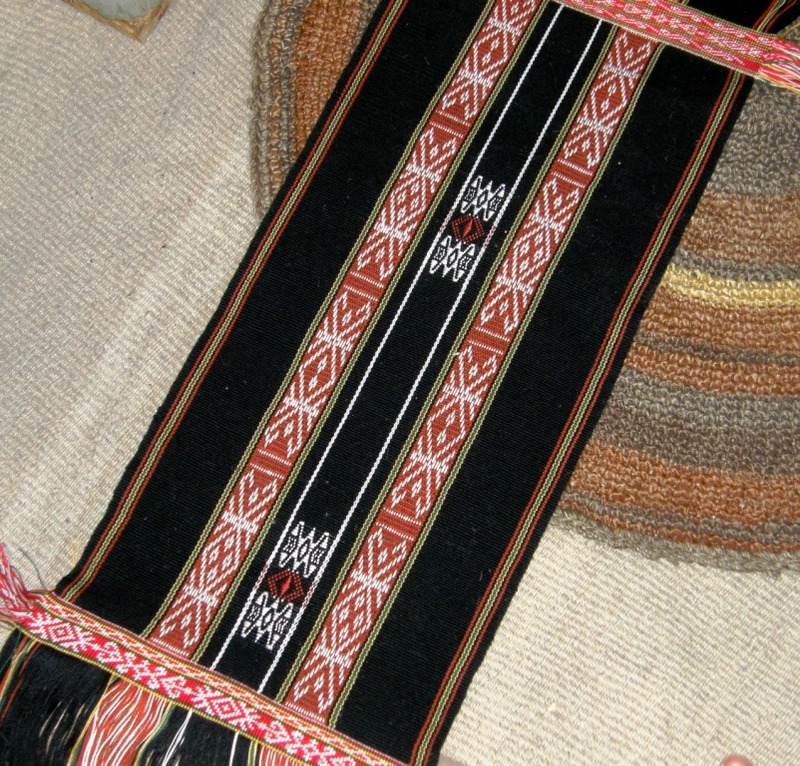 The one on the extreme left is the Li backstrap, made from fiber, which is believed to be from the weavers who speak the Meifu dialect according to collector Pamela Cross. The one on the right is probably from a completely different part of the world. 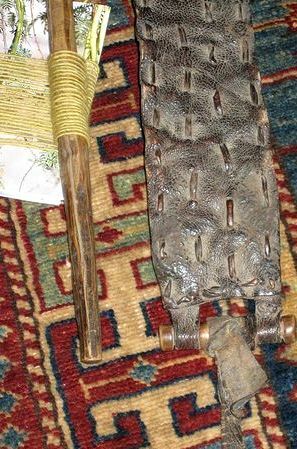 This was gifted to Tracy who lives in Qatar and who unfortunately does not know anything about its origin. 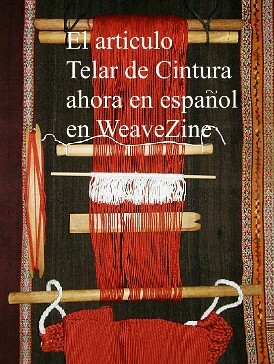 I love them both and wish that the weavers here in Bolivia had such interesting ones! 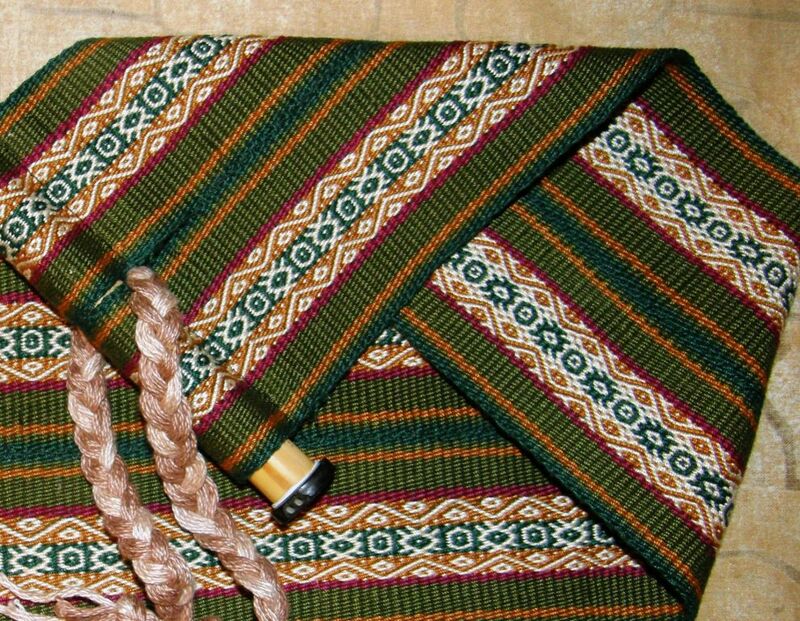 Most weavers I have met here have had no interest whatsoever in constructing any kind of special backstrap and have been quite content to use any old piece of sacking that is lying around. When it was done, it was too wide to be a guitar strap and too long for anything else that I could think of. So, it got shelved to be later made into a loom bag of some sort…again, I was kidding myself. It isn’t quite finished yet. I have just joined the two pieces together with rough tiny stitches and am now using the cross knit looping or Van Dyke stitch to make a stronger and more decorative join. You can see a video on the Van Dyke stitch in this blog post. I used bamboo sections on the ends of the strap stolen from a cheap set of panpipes and the dark ends on the bamboo are pieces of tagua nut that I bought in Ecuador which are only held on with Blutack until I can get some strong glue. I have collected nice backstraps from a few other countries – a fiber one from Peru, a leather one from Guatemala and a very unusual hide one from Ecuador but nothing interesting from Bolivia. A nice sturdy hide backstrap from Otavalo, Ecuador. 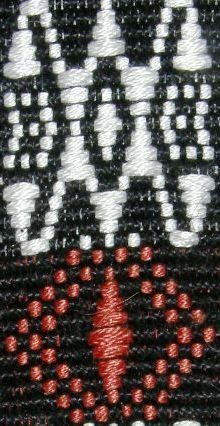 The hairs tend to tickle while you are weaving. 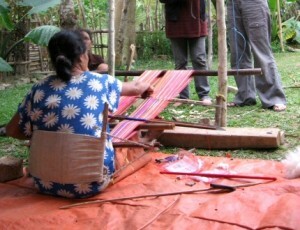 I found the image at left on this site about backstrap weaving in Timor. Timor is so close to my former home in Australia. I am seriously thinking about making a trip there the next time I go back to Sydney. 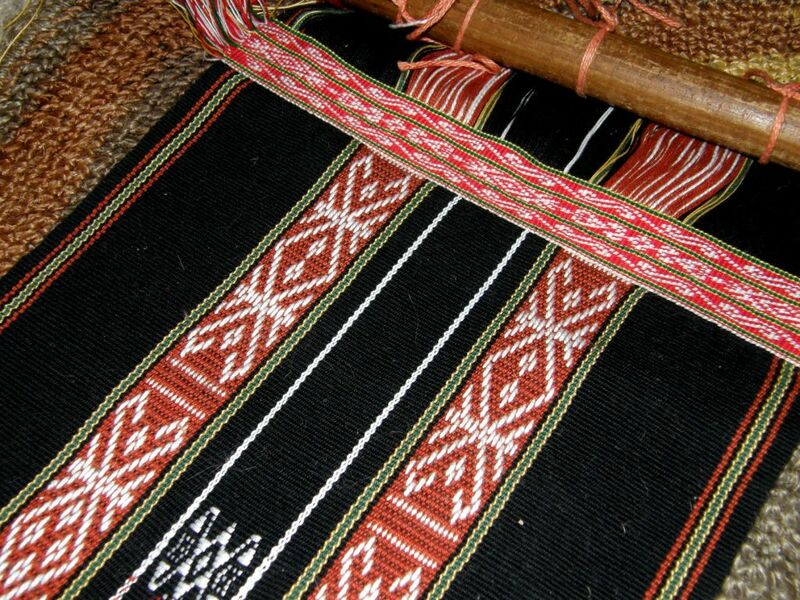 In the picture it looks like the weaver is making two pieces at once side by side as Montagnard weaver Ju Nie often does. Claudia from Weavolution finished her backstrap (on the left) and found a good place to tie up her loom in the process…to the bottom of the sofa (but with her back to the tv!). Anna who you may remember is cycling down to Tierra del Fuego wove her own backstrap while on the road. She has been weaving pebble weave and double weave until now and told me how lovely it was to cruise along with plain weave for a change. Anna does not, of course, have a regular tie up spot for her loom and I always look forward to seeing where she is weaving. You may remember seeing her warp tied to her bicycle on the Uyuni salt lake in a previous post. 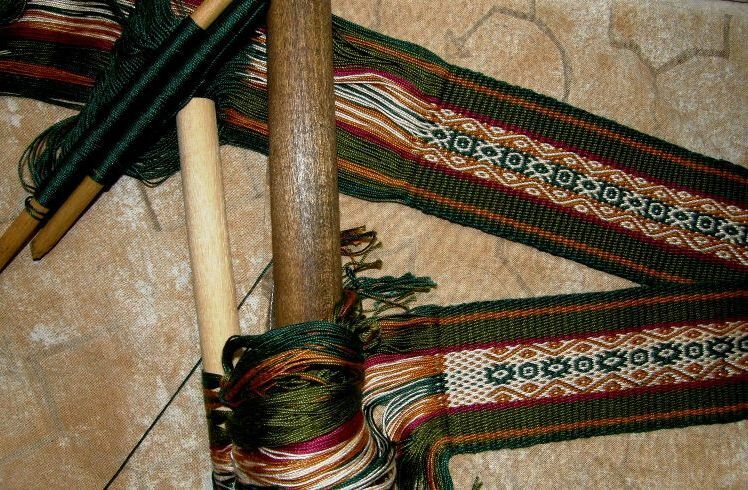 Jennifer has her backstrap on the loom right now and I caught this image of Melisende’s “ceinture” on a French forum called Tricofolk. I didn’t ask her permission to post this here and hope she doesn’t mind! Bonjour et bienvenue aux tisserands de la France! I know that at least Jennifer is getting ready for a backstrap Weave Along that was proposed in the Backstrap weaving Group on Ravelry some weeks ago. We all agreed that post holidays would be the best time to start and we should be underway in January. The exact date is yet to be announced. This will be a chance for beginners to make their own bands and backstraps with lots of support and advice on the forum. 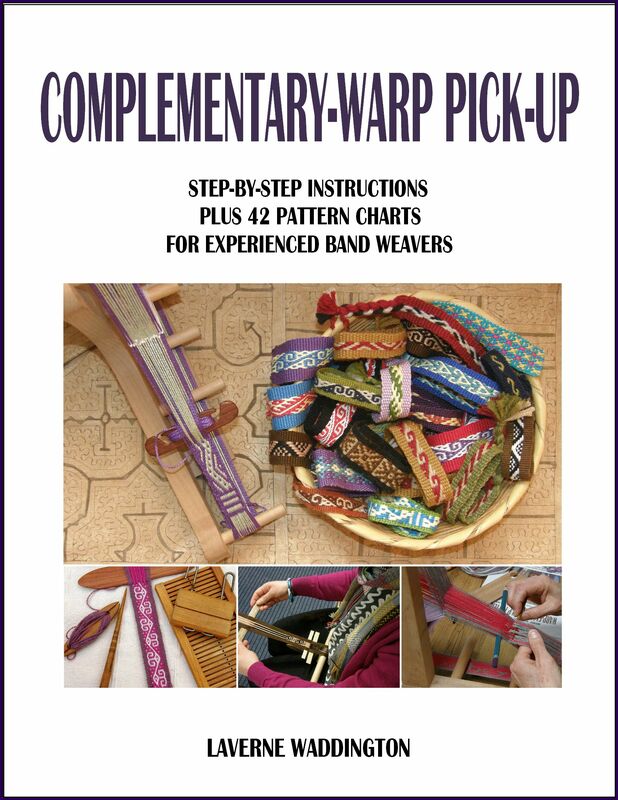 Those who have already woven their first pieces on a backstrap loom can try their hand at a project or two. I will be putting several proposals and ideas in the forum based on the tutorials here on this blog. 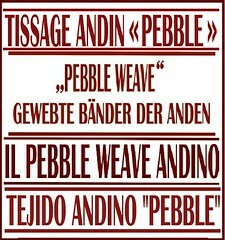 A few weavers have asked about forming a group to work through my Andean Pebble Weave book too. So, all levels are welcome to join in. An evenly tensioned warp is essential. The warp will not be cut, threaded and retensioned once it comes off the warping stakes so you need to get it as evenly tensioned as possible while you are winding it. Beware of using stakes that are loose and may lean in as you are warping. The photo above right is from Franco’s blog. I am sure that Franco made sure that those stools were heavy enough to not move during the warping process. You can read more about warping and see videos here. 2. Find a strong and secure place to tie up the far end of your loom. It is always better in my humble opinion to lash your entire loom bar to something rather than have it swinging in space. Experiment with the angle of your warp and find what is most comfortable for you. 3. Choose your yarn carefully. Don’t use wool for a first project. Try to find a mercerized crochet cotton. Size 3 crochet cotton is good for beginner practice bands. Heavier cotton is better if you want to make a backstrap. Don’t use the cottons that are sold for dishcloth projects. Tahki Cotton Classic is a good choice for making a backstrap. Cathyz made the purple strap above with this thread. WEBS recently had a sale on Tahki Cotton Classic and I got a grab bag of ten skeins. Other brands that are readily available at Michael’s, Hobby Lobby and such places that I have tried and recommend are pictured below…The Fantasy Natural is a good weight for backstraps. I got that at The Mannings. 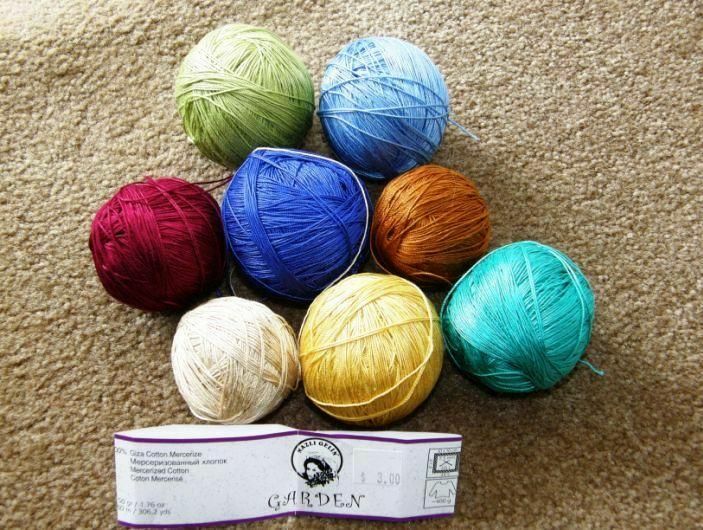 Read more about yarns including some information on using wool here. 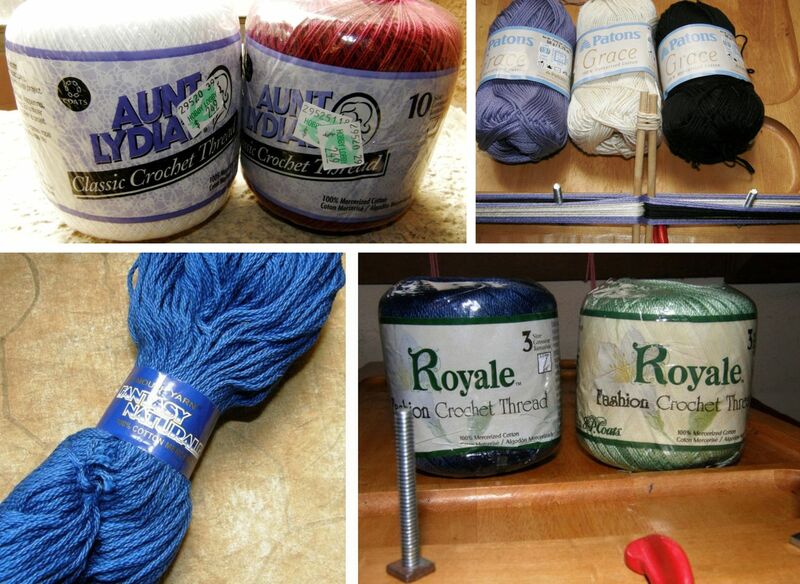 My new backstrap was made with this thread pictured below…love this stuff! 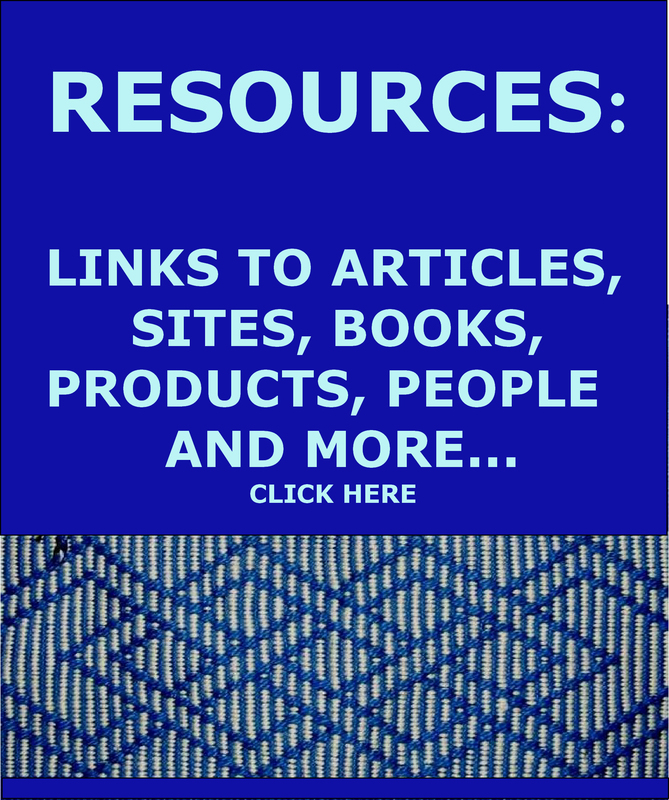 Read more about suitable cotton thread and wool here. Don’t forget the lettering tutorial. Many thanks to all those who visited and left me Christmas greetings last week. Laverne, as usual you are full of inspiration! Thank you for sharing your passion with us, and long may it continue! Its the New Year here in Adelaide in less than 6 hours, so I want to take this opportunity to wish yourself, and all backstrappers everywhere, a happy, peaceful and creative 2011, full of lovely yarns and textiles. May your shuttles always be full! May the new year be as fantastic and colourful as the wonderful things you weave and share with all of us all over the world! I wish you a gorgeous new year – with lots of time for weaving and many exciting contacts to other weavers or crafting people!! Thanks for your fantastic blog posts, I always look forward for fridays now! Querida Laverne: Feliz Año 2011, que tengas un lindo año y que puedas seguir haciendo lo que te apasiona. Gracias por todo lo que nos entregas con tanta generosidad!! As usual a very interesting article. Now I have waaayyyyyyyy too many ideas for the Ravelry Weave a-long! Just have one more small project to finish for a friend as a late Christmas present and then I will be ready. Maybe I will have to use that for my project. Anyway I am glad you had a lovely Holiday season and I wish you the Happiest of New Years! Another great blog, Laverne. I hope you had a fab festive season! Don’t do resolutions — you are fine just as you are! I have a backstrap that I want to show you — I’ll email a photo. This was bought in India and the person who gave it to me thought it was part of a camel harness. Anyway, I’ll send the picture and see what you think. Thanks again for your wonderful blog. I couldn’t finish this year without wishing you all the best for the New Year coming, and lots of interesting journeys and discovering in your favourite hobby !… though I haven’t been weaving anything since I’m back to France, I keep on reading with lots of interest your passionning adventures. Thanks again for all your generous sharing. Bonjour Laverne, and I wish you an Happy New Year ! 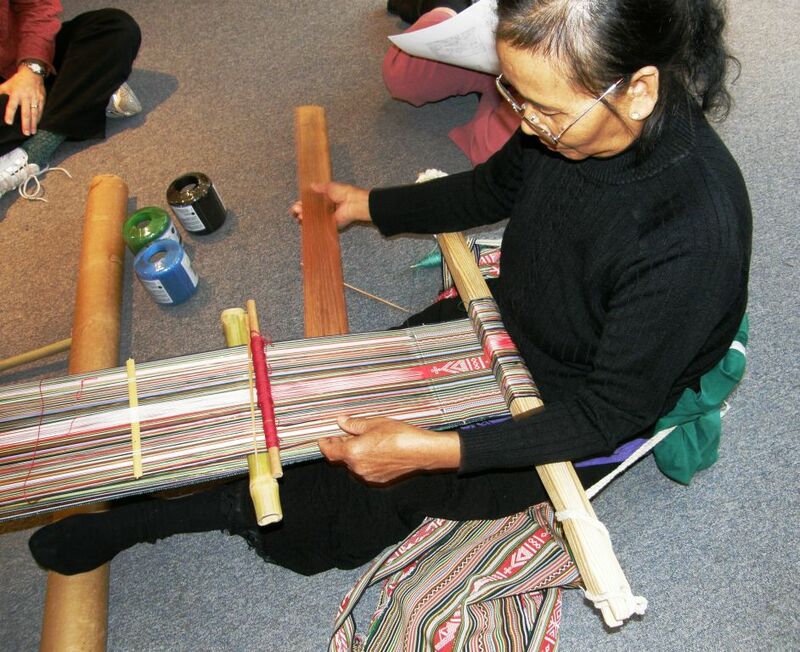 Thank you for sharing all of your wonderful techniques about backstrap weaving. 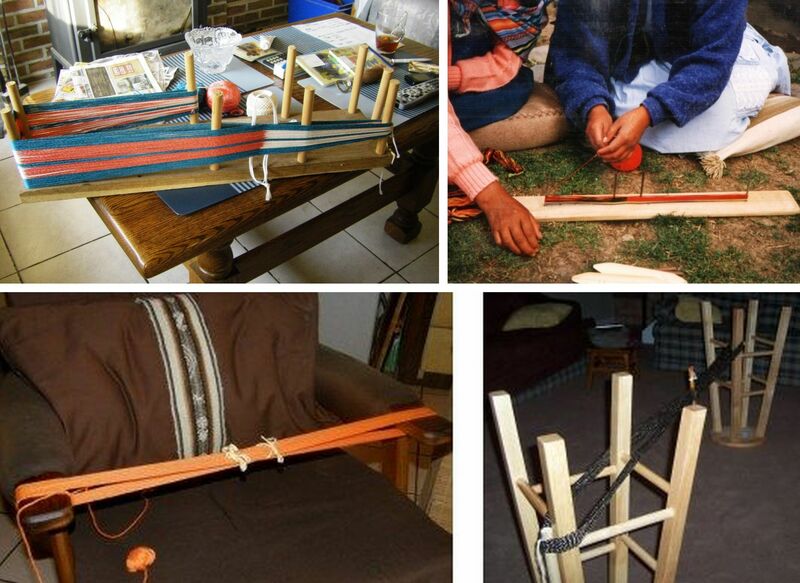 I will probably try soon, on an Inkle Loom I think. 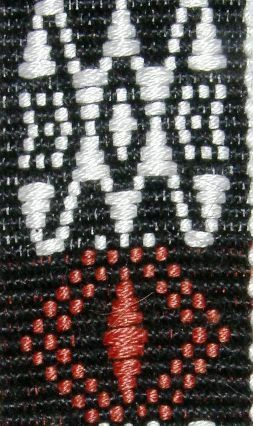 Trop contente que tu aies pris la photo de ma ceinture sur le site tricofolk pour la mettre sur ton blog. 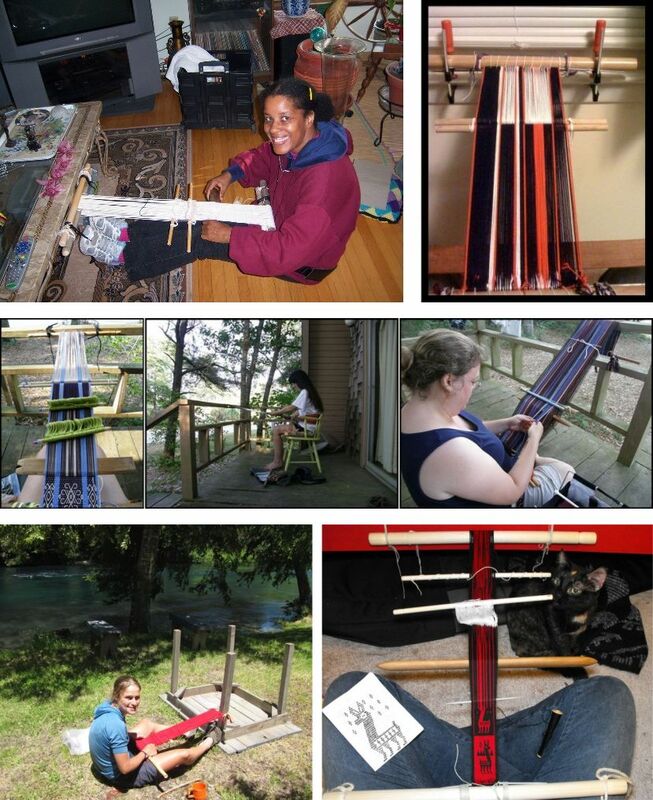 About the first warpingboard on the left.This was the first warping board I made in my beginning weaving days to use with a rigide heddle loom. At first i used very big nails in the heavy oak board but they got rusty so I drilled holes and inserted wooden dowels . Only one broke of at the side .I still can use it for warps for my backstrap up to +/- 2,5 meters. Warping really is essentioal and I can tell. I made a mistake in this warp and it gives me trouble all the time. But now I know where the mistake is and I am still going to weave it until the end. The artistry of your weaving is truly an inspiration Laverne, with such beautiful colour sense and perfect technique! 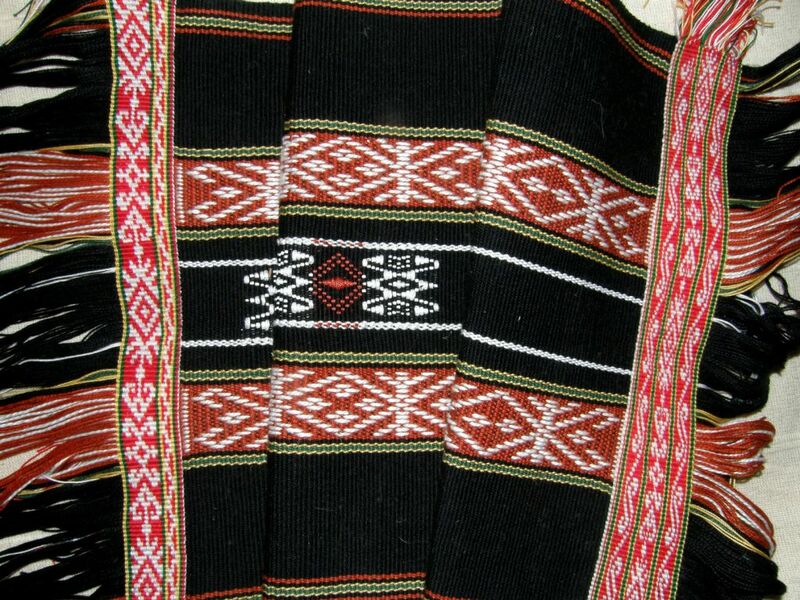 We have put your comments and link on the Hand Weaving page of our website. 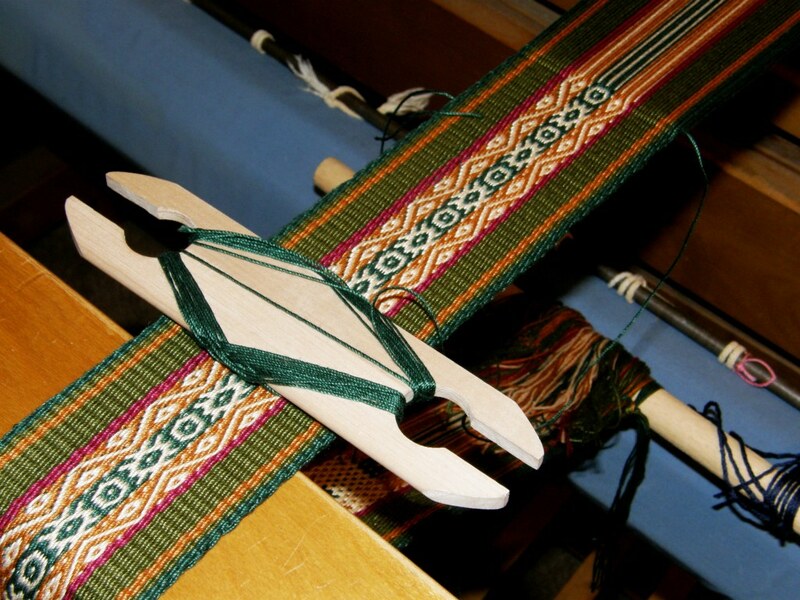 Do you suffer back-pain while weaving with the back strap loom? The weavers in Timor sit on a mat on hard dirt floors and suffer lumbar pain from the prolonged periods of sitting in this position. 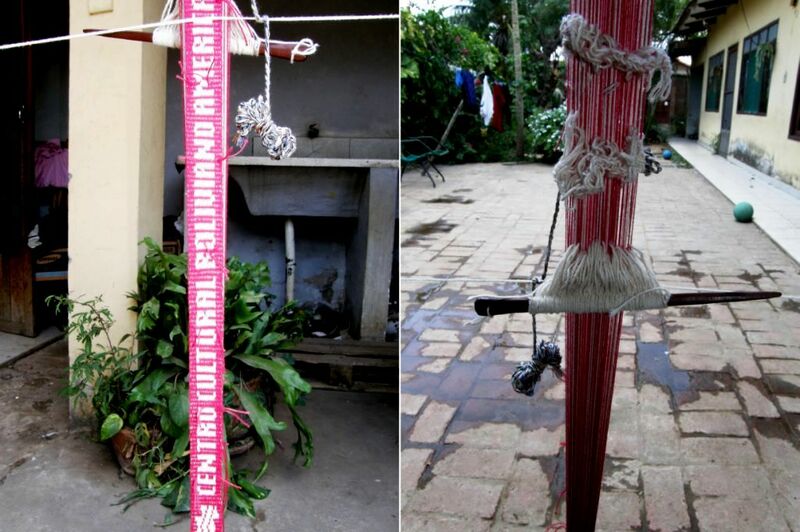 Health and postural issues are being addressed with the women and hopefully we can start to introduce a modified loom which allows them to sit off the ground – much like some back-strap loom modifications introduced into Guatemala. 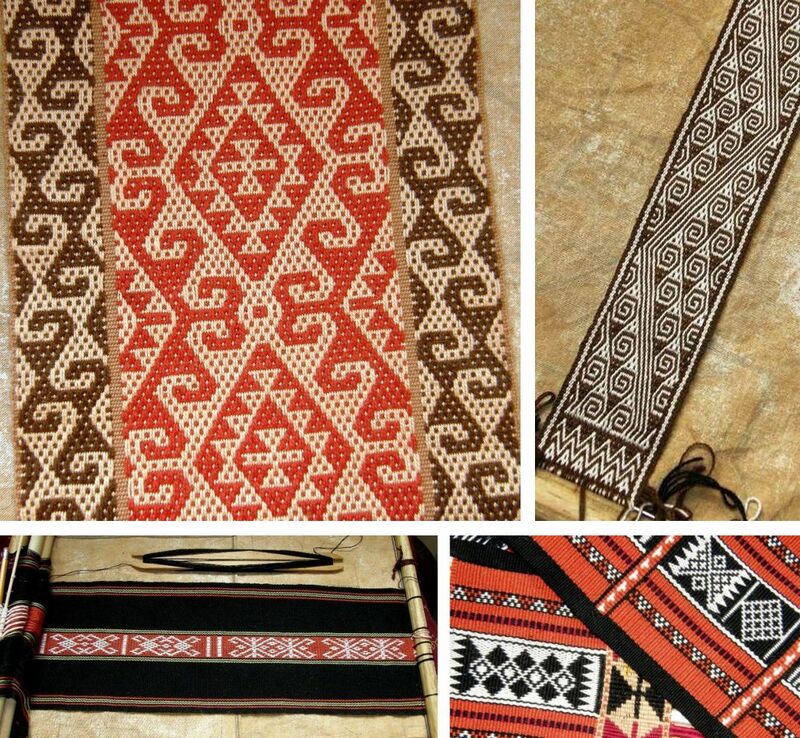 We are running a Weaving Tour to East Timor in Sept/Oct this year including a workshop with the Iliomar weavers – so if you’re in Australia around then, come and join us. Keep up your exquisite art and weaving life – your website is impressive but more so, the ability to bring people together through artistic-cultural participation!